I just finished a nice gaming session with the Prawn this morning. Since he transferred to a new school we just don't get in as much ASL (if any) as usual. 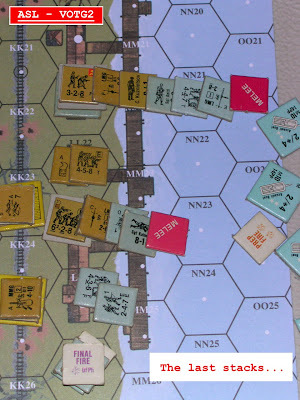 Today we rocked The Fires of Midway -- a game by The Hell of Stalingrad designer Steven Cunliffe. The Prawn's IJN sank Midway Island, USS Hornet and USS Yorktown whilst taking only one carrier loss and a whack of planes. Highly recommended for anyone who likes the PTO. Just plain fun! So I checked the mailbox upon the Prawn's leaving and discovered Out of the Attic 2 from MMP! Nice! I love surprises (I forgot I had pre-ordered). What was an even better surprise was the way my mail carrier enjoys envelope origami. Now, I know that the envelope doesn't explicitly say "Do Not Bend" but that doesn't grant carte blanche... It was very difficult to pry it out. Good news though, the magazine itself is in excellent shape. I've scanned the magazine which is meant to serve as a kind of "best of" compilation of scenarios and articles for ASL from various sources over the years. For example, there's a couple of scenarios from Lone Canuck's George Kelln (Go Canada!). For newbies, the most obvious content is the "Tactics 101" article by Mike McGrath who exhorts new players to "kick their opponents while they are down". Good stuff. 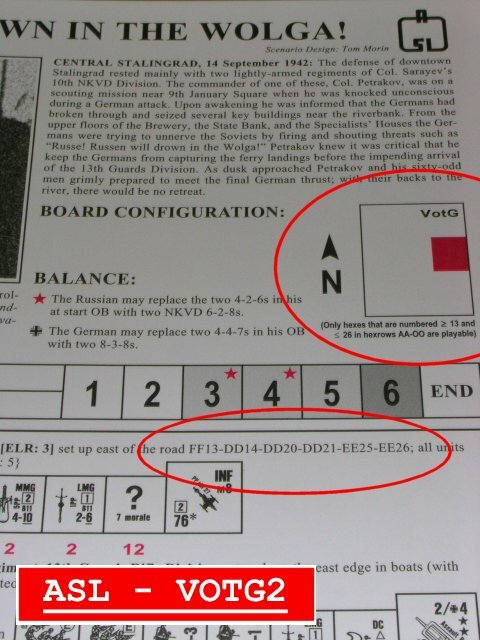 There are a couple of articles on AFVs -- a ruleset that sometimes boggles the new ASLer. The "Squad Leader Clinic" looks very interesting. Newbs looking to step up or to get a preview of full ASL (other than looking through the scenarios) can check out the article on Snipers and the one on Bypass -- two very important rule additions when moving from ASLSK to full ASL. Overall, it looks like a new bit of "must have" stuff for ASLers. Kudos MMP. p.s. Here's the back cover -- can't wait to see PTO ASL! Should a newbie buy ASL Journal? Hmmm... I get this question all the time*. Short answer: yes! But I know you don't frequent this blog for the short quips; here's the long answer. This past week I was up at the cottage. My wife's family has a nice one in Tobermory, Ontario and we trudged up there to enjoy a week away from it all. I took up a few small games like ATO Magazine postcard games and some reading (Antony Beevor's D-Day -- not sure if I like it, his Stalingrad was superior imho). In the stack were the ASL Journals 2 and 8. Now, I've only four full ASL games under my belt at this point so I consider myself still firmly in the "newbie" category. So the question remains, is it worth the money to pick up Journal 8 ($20) and/or Journal 2 (reprint $50). Aside from the well known ASL Axiom of "ALWAYS BUY STUFF WHILE IT'S IN PRINT" (see WO Bonus Pack) the answer thoroughly depends on whether you ever intend to make the step up to the "big leagues". And even if you don't you can always sell the thing for a princely sum when it goes out of print. Anyways, here's a brief couple of reviews of the two latest Journals. I'll start with the most recent Journal. There are actually two articles that are directly addressed to newbies: Mark Pitcavage's "The Agony of Defeat: Why Bad Things Happen to New Players" and John Slotwinski's "Tips for Making the Transition from ASL SK to ASL". In the former, Mark details and gives concrete advice to players who want to improve their game and stop making horrible play errors. It's fairly succinct and damned direct. In Mark's own words he tells you "with appalling frankness, why you are bad." I love it. In the latter, John makes the very excellent point that "ASLSK is ASL". For those timid ASLSKers, this might blow your mind. Having played full ASL I know what John says to be absolutely true. You've probably heard it before, the majority of the ASLRB is stuff you don't need the majority of the time. So, unless you have the brainstuff of a flea it's not a big deal to just pick the relevant sections for a new scenario and quickly read what is applicable in the rulebook. 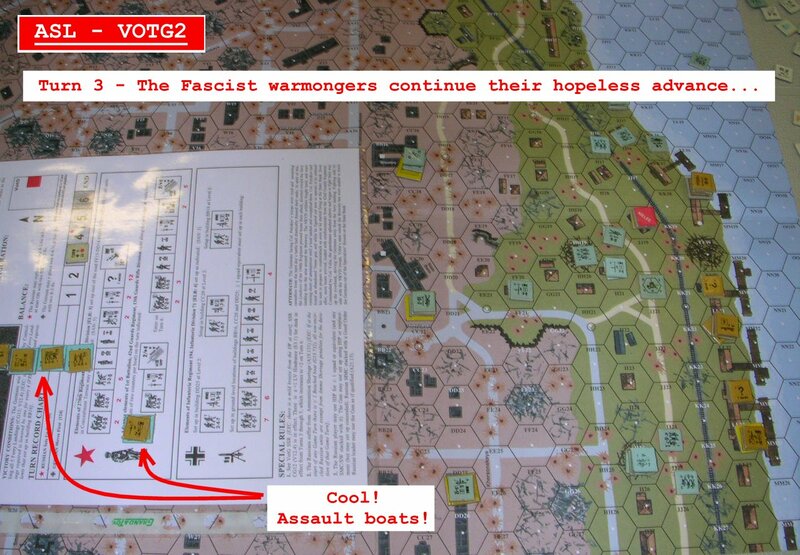 Case in point, in VOTG2 with Andy, I read up on the Assault Boats while we sat at the table setting up and playing. No problem! What else is useful to the ASL newb in Journal 8? Other than the (endless) errata for full ASL products there are some great articles that don't require full ASL knowledge. There's a great preview of the Finnish core module, Hakkaa Paalle, and if you like designer notes (I love 'em) there are articles about Action Pack 4 and the Turning the Tide scenario pack. Want to be a better player or at least get into the minds of better players? 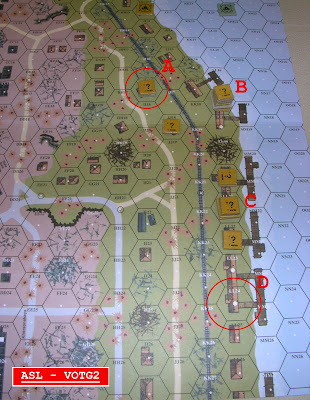 There are two articles analyzing scenarios in the Journal from three experienced players (J.R. Tracy, Bret Hildebran and Matt Shostak). 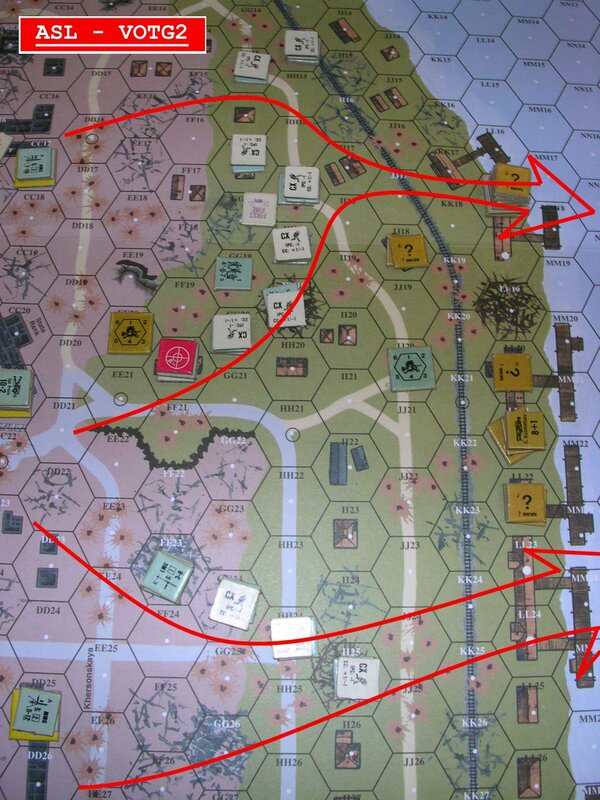 Finally there are two more articles on different aspects of the sequence of play, Vehicular Overrun and Setup. I'm not forced to read those advanced articles but I'm glad they are there and even a brief skim with my limited knowledge gets my ASL juices flowing. Oh yeah, and there are 16 ASL scenarios. I've even played one! (VOTG19!) So thumbs up! At a fair price of $20 I don't think ASLSK-level players need to avoid this one. This one's a little pricier at $50 or so. But look at all the neat stuff you get! The original Journal was fetching quite the premium on eBay for the longest time (remember: BUY EVERYTHING IN PRINT WHEN YOU CAN) and MMP felt the demand was there. First of all, there's a hojillion scenarios. Secondly, it's neat, at least from my perspective, to see a slice of ASL's history before I played the game. For example, Curt Schilling wrote the intro and an article and a few scenarios in this Journal. Okay, but what's useful to the ASLSKer? I don't want to sound like some guerilla marketer for MMP but I have to justify the expenditure of cold hard cash for these ASL products too. In my mind, the cost is well justified before I even play a single scenario. Or am I just hoarding stuff to fulfill my rampant OCD? Not quite the tight quarters as VOTG19 nor were we starting off in the same bloody buildings. However, you'll note the nice blue river hexes on the right (east) side of the map. My troops literally had their backs to the wall here. The scenario revolves around the dusk of September 15th 1942 when STAVKA releases the 13th Guards Rifle Division to General Chuikov's control. The Germans are already having a hell of a time prying the 62nd Army out of Stalingrad so it was critical that they interdict the flow of reinforcements. Couple of other things in that picture above: (1) note the board configuration -- again, it's a tiny subsection of the whole VOTG map; (2) dusk effects start on turn 3 where hindrance starts affecting shots so that by the last turn there's an automatic +2 on shots. You know where this is heading... close combat! Whatever, I'm sure Vasily Zaitsev would show up and take them all out anyways (hehehehe...). My set-up included 12 ? markers which I tried to do better with. I'm sure I don't really cause much consternation to Andy when I haphazardly place them in sub-optimal positions. At position (A) I put a stack of 4 of them down. It was a fairly conspicuous house with some very good sightlines on the northern flank. Again, I'd normally put an MG in there but this time I was playing waaaay back. I meant for it to slow Andy down for a turn at least and I think it did its job. At position (B) was my larger leader-led stack of fun on Level 2 (third floor kids!). 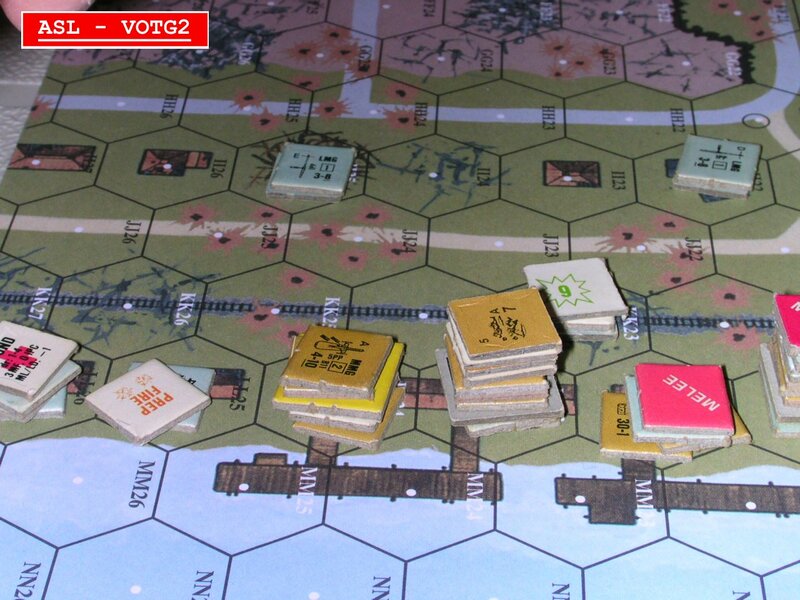 I didn't realize it at the time but I was a sitting duck for prep from the MG nests on the top of the hill. Regardless, their main purpose was to make taking their building very difficult and to be the biggest speed bump. At position (C) was my INF Gun led by one of the Commissars. I was not allowed to set it up in HIP but it had good sightlines and would be something to reckon with. Finally at position (D) I put a 6-2-8 squad with MMG HIP'ed in hex LL24 Level 2. I think it was a nasty surprise...! Here's a pic of Andy's set-up. Note the three MG nests up on the bluffs (when am I going to remember that the pink terrain is a level up?!). These guys made it incredibly painful for my guys. In retrospect it was probably a good idea not to set my guys up the west -- I have a feeling that they would have been shot-up, routed and interdicted by the MGs all day long and as it turned out I would need every able-bodied man on the last turn. 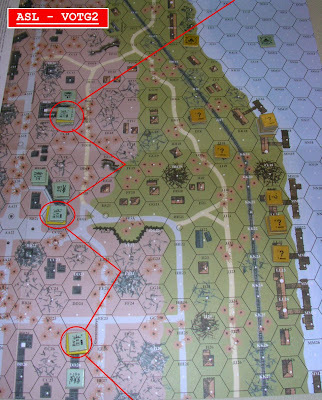 The Germans get the first moves in the scenario and they had to make hay. 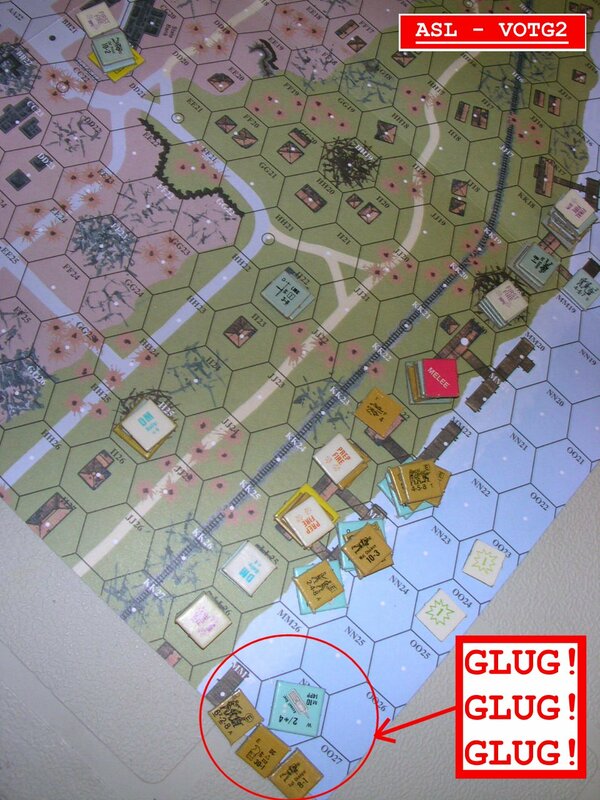 They only get 2 turns without dusk hindrance on shots, then Russian reinforcements (and ammo!) start rolling in off Assault Boats(!) from the east. The reinforcements increase as the darkness starts to fall. 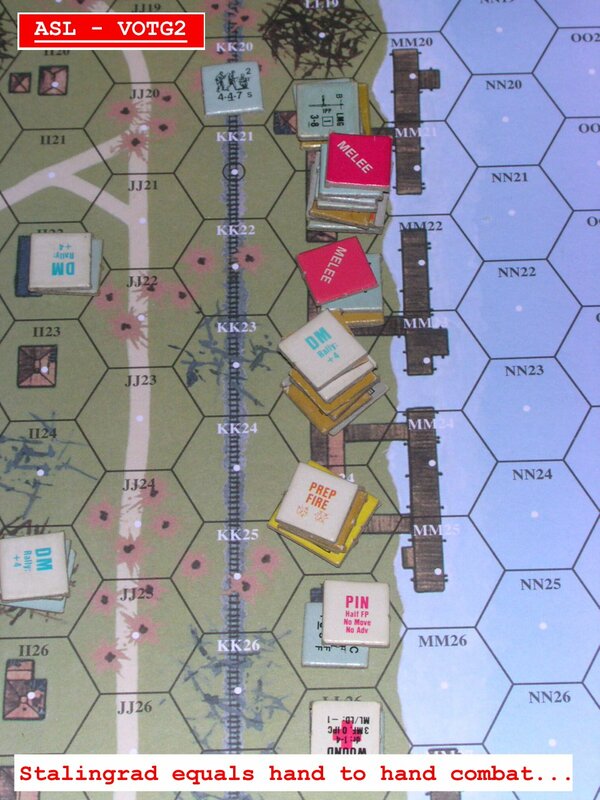 As expected, Andy had to respect my INF Gun and hit both flanks: the north wing hindered only a half-turn or so by the fake stack (who soaked up a 16FP attack); the south wing running, unknowingly into a HIP'ed MG nest. German progress was generally good. I can't lie, I thought that I was in an excellent position on Turn 3, midway through the game. 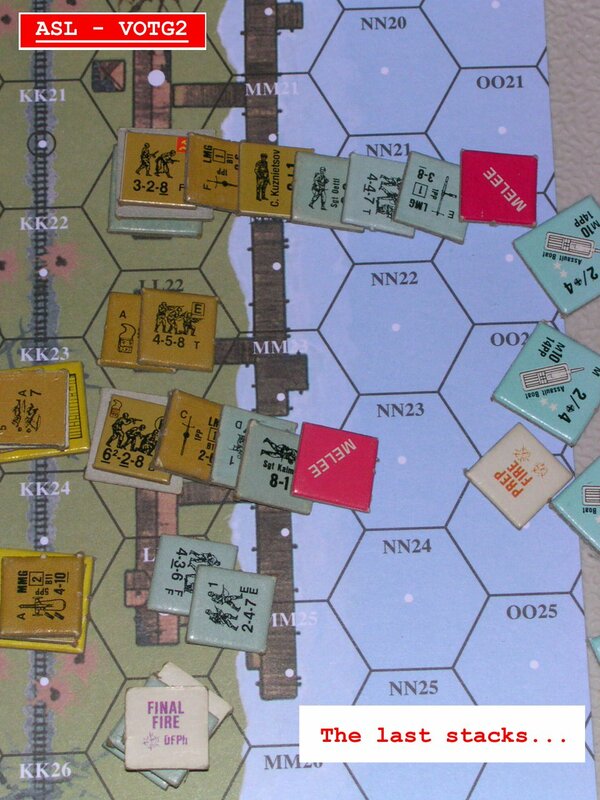 Andy had only so far controlled the northernmost pier which I didn't bother to defend and he was having difficulty rolling up the northern flank. The advance in the south was stymied and the Gun was popping anyone trying anything close to the middle. 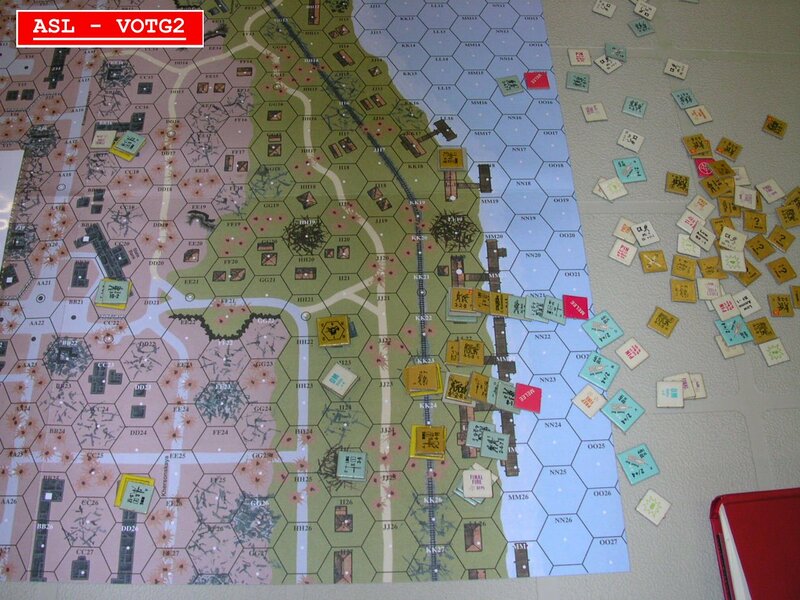 What is more, Zaitsev did show up and took out the southernmost MG nest. Woot! Of course, as ALWAYS happens in ASL, the swing of fortune cause my INF Gun to malf. Uh-oh. There really wasn't anything stopping them now when you consider the pretty impressive firepower still being projected from the German MGs in the rear. A little note about Assault Boats. A pretty common comment from ASL players to their ASLSK brethern is that there is no need to memorize the monster-sized ASLRB. For the most part you only read up on the rules particular to a specific scenario just before you play. Assault Boats is one of those rules. I literally read the rules on them (about a quarter of a page) on Turn 1 and didn't really have a problem incorporating them into my play. So again, if you feel the leap from SK to full ASL is going to be a bear, stop being silly. This is a shot from Andy's perspective up on the bluffs above the Volga. I can imagine that his frustration was quite in keeping with the history. The Germans could see the mighty river from many vantage points across the city but they couldn't ever push enough Russian into it: "Bul-bul!!!" On Turn 4 fortunes swung haphazardly again. 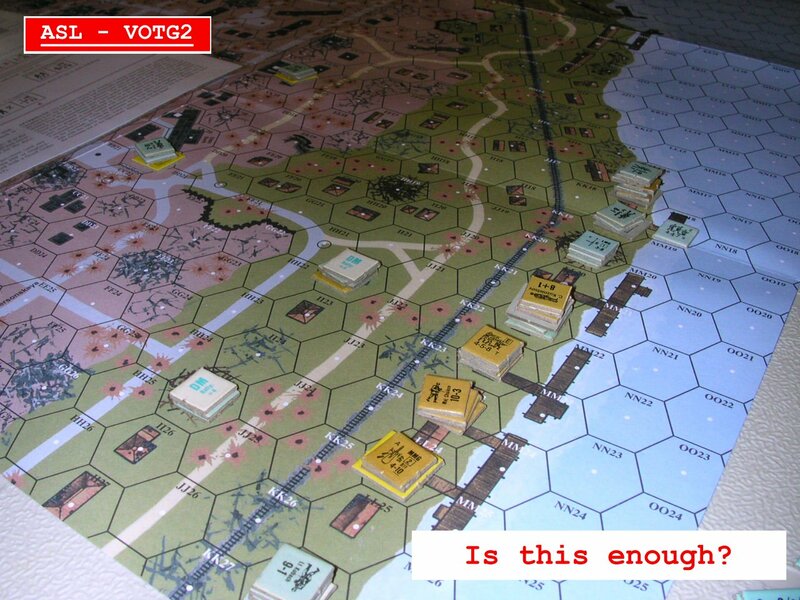 I was sure that I had enough reinforcements now to at least keep ONE VC building from the Wehrmacht... So of course what happens? Here's a nice low angle picture of the odds facing Andy on something like Turn 5. Of course the game would be decided in deadly close combat. It's Stalingrad! Here's another view, close up, of the carnage. In the end, it wasn't quite enough. There were 4 Melees going into the last half-turn and I actually won one of them. The shot above are the stacks on the final few buildings blown up for analysis. I think in the end, Andy ended up taking 2-3 of the 5 buildings he needed and I heaved a huge sigh of relief. It's the first game of full-ASL that I've won and it wasn't decided until the last half-turn. Nothing is quite like ASL to get your blood pressure going. Here's a shot of the whole board at game's end. I think it took us 4 hours or so? Andy will correct me if I'm wrong. That's a whole lot of cardboard carnage. 1. 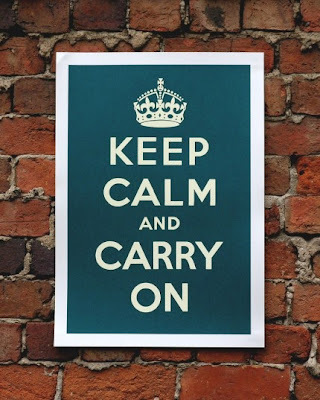 My ASL notebook had the British wartime slogan "Keep Calm and Carry On" on the front cover. Lo and behold, Andy wore a T-shirt with the same slogan. It was a hilarious moment. 2. My overall strategy was to delay bits and pieces of the German forces at a time. I had no illusions that I'd get a huge game changing shot at a killstack but I tried to pick a bit there and a bit here. I held off shots as long as possible on defense til I had at least the x2 PBF mod. 3. A big equalizer to the MG nests? The Russian SAN of 5. That number comes up a LOT. 4. Major Chuikov was a 10-3. Andy remarked that he'd never seen a more useless 10-3 leader ever. Brutal. You are a disgrace to the name sir! 5. The game closely held to history. Like their counterparts in 1942 the Germans got close. But close is not nearly enough in Stalingrad. Good times. Once again, a hearty thanks to Andy for being a great sport and supplying the kit. Thanks to TABSCON for hosting the space for our game. Thanks to MMP for Valor of the Guards especially designer Tom Morin -- daaaamn this game is fun. ALWAYS DOUBLE-CHECK THE SET-UP INSTRUCTIONS FOR BOTH SIDES!!! Well it's been two weeks since "The Drubbing of Andy" and where's the AAR? Well funny thing. I went to Chapters/Indigo the day after with the family and they had a nice selection of military books on the discount table and lo and behold... there was Jon Bastable's Voices from Stalingrad and William Craig's Enemy at the Gates. I added a couple of reference books (planes and tanks from WWII to present day) and I started reading. The AAR was delayed because I love reading about Stalingrad. And these two particular books (along with some of the others I have on the topic and Eastern Front in general) specifically address the action in VOTG2. 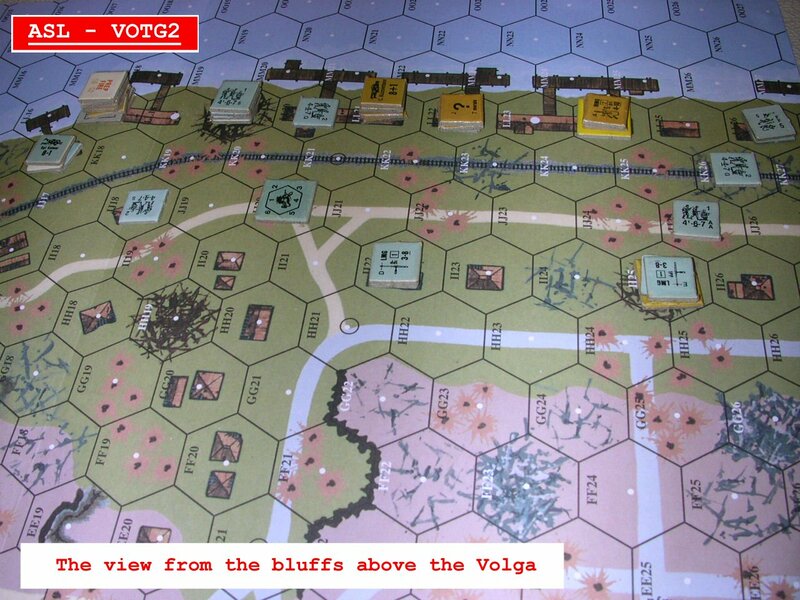 The scenario falls on a fairly early date in the Battle for Stalingrad while the Wehrmacht is attempting to close the Volga life-line to the Soviet defenders of the city (something they were never able to fully do). The title itself comes from the taunting of the German soldiers in the surrounding state buildings as they tried to push the last few defenders in this sector into the river. Russ! Zavtra bul-bul! Translation: "Russians, you're going glug!-glug! soon!" So, this peculiarly named HASL scenario actually has some neat backstory! See pages 91-93 from Enemy at the Gates. What is key to the scenario though are the reinforcements. Their story? It was on that day in history that General Chuikov, commander of the Russian forces in the city asked for and got the ultra-critical reinforcements he wanted from STAVKA, the 13th Guards Rifle Division. 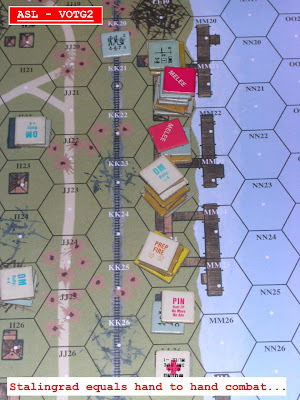 The scenario takes place at dusk (SSR indicates growing light hindrance as the game progresses), the only time the Russians could safely cross the river without getting blown away. All this is simulated in the scenario, again, on just a small sub-set of the main VOTG map (which Andy cannot stop raving about and I'd concur). What is critical in the scenario was critical in history: the trickle of men to merely keep the fascist invaders at bay. 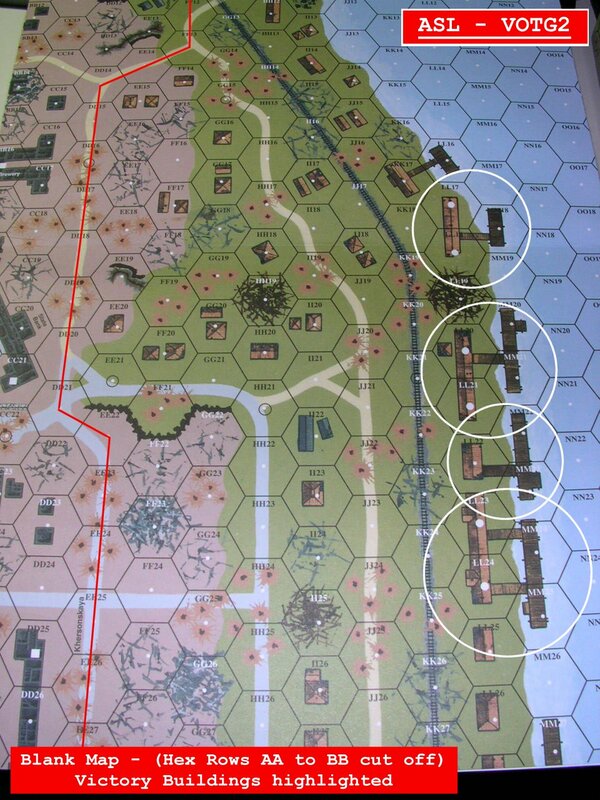 Speaking of SSR, the Russians start the scenario with an INF Gun and according to the history, the commissar in charge, a Col. Petrakov, impressed a few of his conscript troops to handle the thing. So, if the commissar is incapacitated in the scenario, so too is the Russian player's ability to use the Gun as their "crews" don't know what they are doing. What impresses me is really seeing the link between the history and what is possible in ASL. The designer, Tom Morin, took what is a semi-exciting narrative in a few history books and is able to create such a credible and exciting gaming experience. 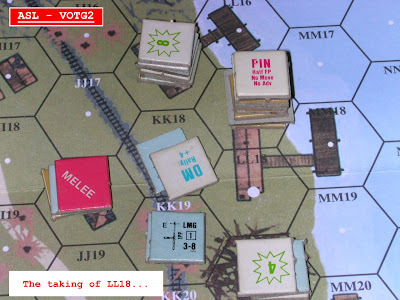 It's funny because ASL, as I understand it, was originally built to service DYO scenarios where you'd put points of troops up against others in some hodge-podge melee. The H(istory) part of the HASL in the game is where the vast majority of the game's current adherents truly focus. It's not a stretch to say that many scenarios need to be as close to airtight as possible on the historical aspects or players won't even bother. So kudos to Tom Morin and other scenario designers who put in such efforts. In this particular instance, someone (me!) has noticed. Nice job. Antill, Peter. 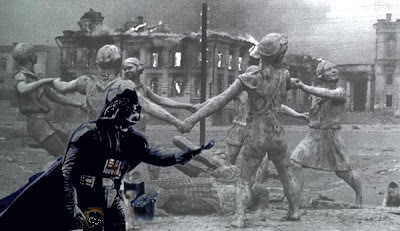 Stalingrad 1942. Osprey Publishing. Great Britain: 2007. - Your standard, basic, Osprey title on the campaign for Stalingrad. Beginners start here. Bastable, Jonathan. Voices of Stalingrad: Nemesis on the Volga. F+W Publishing. United Kingdom: 2006. - Bastable does a superb job with collecting and showing us the words from the combatants and victims themselves from the 200-day long battle. Beevor, Antony. Stalingrad - The Fateful Siege: 1942-1943. Penguin Books. Great Britain: 1998. - Absolutely required reading from one of today's most popular historians. Beevor also has books on the fall of Berlin, Crete and most recently, D-Day. This book on Stalingrad is awesome. Craig, William. 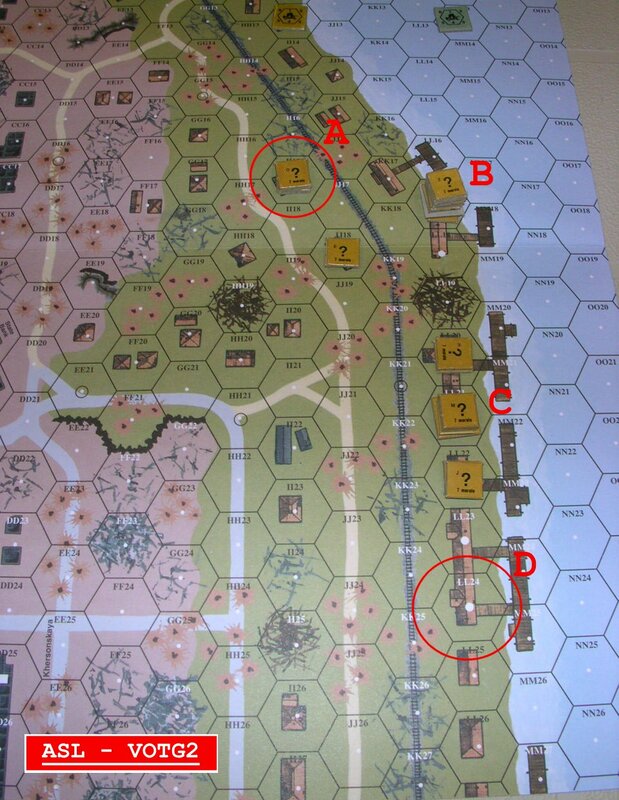 Enemy at the Gates: The Battle for Stalingrad. Konecky & Konecky. USA: 1973. - The basis for the movie (which is NOT history but Hollywood). Some of the stories in the book have apparently not stood the test of time academically -- however, it was the first, and for a little while, best, book on the subject. Well worth a read too. Glantz, David & Jonathan House. When Titans Clashed: How the Red Army Stopped Hitler. University Press of Kansas: 1995. - Glantz is well known these days for his huge treatises on the Eastern Front which have absorbed the now (more) open Soviet archives into their narrative. Can be a bit dry but has fascinating detail into the Ostfront and how the Russian Operational Art of War stopped the Wehrmacht cold. So there you have it. I've been reading. Part One up next! 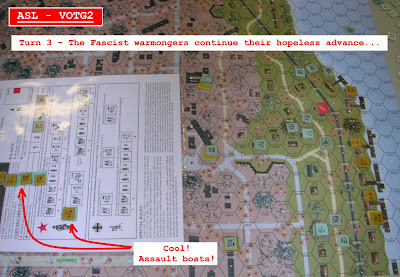 Just finished up the photos for the VOTG2 AAR. Valor of the Guards, well, Stalingrad really, is fast becoming the ASL battleground of choice for Andy and I (and the Prawn). As my marking pile has dwindled to nothing I've refered back to my new ASL notebook, the one I keep AAR notes in and possible future topics for chatter on this blog. The virtual deluge of new ASL stuff has been really impressive of late and I want to comment on it. I declare this the Summer of Games! Just got back from TABSCON June 2010 Edition and had another awesome time. I only got in two games. The second was The Pocket at Falaise from ATO Magazine with Lembit Tohver, its developer (great game btw and nominated for a CSR Award). The first was VOTG2 Russe! Drown in the Wolga! with Andy. I'm proud to say I took the peksy Russkies and won a tight one on the last half turn, holding on to the Victory buildings. Nice! Another package full of ASL goodies from MMP this afternoon. It's the J2 reprint! Ye olde contents slip. This is one fully packed magazine. One and a half countersheets that presumably go with the Kakazu Ridge HASL scenario and map. There's also Chapter Z for the HASL. Here's the whole shebang. Nice! And above is a snap of the Table of Contents -- because there's actually a magazine in there! 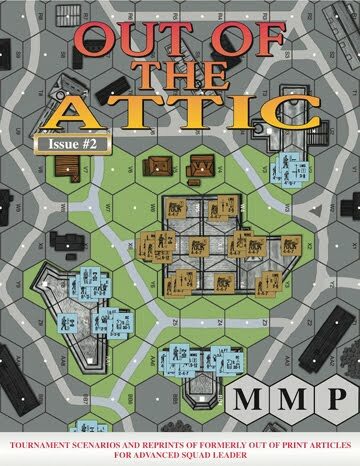 If you scroll down to the bottom of the MMP pre-order page you'll find the latest ASL pre-order: Out of the Attic II! The original Out of the Attic was published in 2003 and ostensibly contained rarer out of print scenarios and interesting articles. Looks like it's enough of a niche that Chas has stuff to fill it up a followup issue. Of interest for newer ASLers are the "tournament" scenarios -- read as finishable in a sane amount of time -- and the articles which seem to slant a bit towards helping newbs get over the hump (cf. Mike McGrath's Tactics 101 article!). You know the drill. Go pre-order it! ADDENDUM: More details here on the scenarios. For those of you who don't frequent the user-unfriendly atrocity known as CSW, here's the latest on what's going to be in that frickin' box. It looks like a lot! The point is to make the system smaller. Easier to keep the core in stock. One PTO module. One Desert module. Hell, if it wasn't too late i'd stick the Americans in with the British and call the module "The Good Guys". The Ethiopians are going in Hollow Legions which will have the Italians and in all likelihood the Desert and anything else we can squeeze into the box. Despite the fact that I just cringed because I implied the Ethiopians are somehow "core module". MMP Web Sale - ENDS TOMORROW! Brian Youse posted on CSW that the web sale ends MONDAY. Go! VASL - Virtual ASL FREE! A life-long gamer from the GTA in Ontario, Canada, whose silly geek attention has been riveted on ASL. This is his humble blog. #1. DON'T BE AFRAID OF MAKING MISTAKES! #2. DON'T MEMORIZE THE RULES THE FIRST TIME THROUGH - PUSH CARDBOARD ASAP! #3. TEACHING SOMEONE ASL CAN BE GOOD FOR LEARNING ASL! #4. ALWAYS PLAY WITH A NOTEBOOK HANDY -- TAKE NOTES! #5. PLAY ASL "COMPETITIVELY" IN A LEAGUE OR TOURNAMENT. #6. REVIEW YOUR PLAY AND LOOK FOR WAYS TO IMPROVE. #7. NEVER GIVE UP. PASS YOUR PERSONAL MORALE CHECK!